A School Level Science Exhibition was organized by the Science department of VKV Kuporijo on 28th August 2015 in school premises. Total nos. Of 20 models from Cl-V to Cl-X were exhibited. Principal of Govt. College Daporijo, Dr. Vijay Raji made his presence as the special guest. Dr. Vijay Raji witnessed all the models giving words of encouragement, suggestion and appreciation to each participant , expressed his feelings of contentment and hope in regard of VKVs and budding scientists of the future that there is need of keeping scientific temperament, which is the goal of education. He advised the young generation not to get misdirected and look into the truth with scientific approach. The situation nowadays has become so that it has turned to suspect upon the ability of each youth to shoulder the responsibility. Therefore, he suggested the students to be ahead in the quest of knowing the reality behind everything so that the days of the future may look more luminous. A Total nos. of 421 students and other well-wishers visited the exhibition. This Teachers Orientation Camp conducted at VKV Itanagar is mainly meant for the teachers who handle English language in primary and middle level classes. Total 49 teachers have attended the camp. All the participants were astounded to see the marvelous building constructed at VKV Itanagar, the Eknathji Centenary Hall and it was time for us to bow our heads to pay homage to the great soul who lived up to his dreams and beyond and 22nd August was his Punya thithi. On 19/08/2015 about 41 participants reported to the Principal VKV Itanagar Sri.S.C Dixit ji. After the registration, he elaborated the purpose of the camp in nutshell and an informal introduction by the participants and the teachers of the host school followed it. As per the routine set for the camp, we were to get up at 4.45AM and attend the Morning Prayer and yoga at 5.30AM. The Morning Prayer and Evening prayer and Yoga sessions were done under the guidance of Sri.K.K Subramanian Sir a teaching faculty of the host school. 20th August was the day of formal inauguration of the camp. It was a blessed occasion as it was attended by Mananeeya Pravin Dhabolkar ji, the Joint General Secretary of Vivekananda Kendra and Vivekananda Rock Memorial and also the Secretary of VKVs in North East, Sri. Tani Talom DDSE Papumpare District the Chief Guest, Prof.R.K.Jayaraman the resource person of the camp, Sri S.C Dixit Principal VKV Itanagar, Sri.Guruvayya ji the Vice-Principal, the teachers of the host school and the participants. The function started with an invocation by the students and Sri.P.M.Unnikrishnan EO VKVAP Trust welcomed everybody. In his speech he accentuated on the changing trends in education and elaborated on the need to keep up our pace with the changing race. Mananeeya Pravinji’s blessing address was so profound and heart touching. He focused on the ideals of Swamiji and the role of Kendra in disseminating his thoughts across the country. Prof. Jayaraman ji, who spoke next, had focused on the importance of language in our day-to-day life. Sri.Tani Talom DDSE Papumpare has elaborated the changing minds and trends of the state. He said that the VKVs are doing a great a job by imparting quality education for the natives. Sri.S.C Dixit ji Principal of the host school had extended the vote of thanks. The classes conducted by the main resource person of the camp Prof.Jayaramanji have been impressive. They were highly informative, brilliantly planned and conveyed to the participants with meticulous precision. Though he told he was 70 years old he proved he was 70 years young as far as the energy aspect in him is concerned. He is a simplicity personified man with great experience in the field teaching. He has a vast experience of travelling to various eastern and western countries. He had been teaching at the University of Sanaa in the People’s Republic of Yemen for almost 14 years and had left that country. He was the head of English Department in the university. He had also worked as a faculty member at the Central Institute of Foreign Languages in Shillong for almost 6 years. Apart from securing his degrees from India, he secured his MA in English from a prestigious university in England. He is not only a great teacher but also a great motivator with immense patience. Throughout the four days training programme he had enlightened us on various topics such as: Different skills required in English teaching, how to enrich vocabulary, spoken English, stress in English, rhythm of English, how to teach a poem, how to handle comprehensive passages for the learners, different phonetic sounds, and their practical applications, the common errors occur while writing etc. On 20/08/2015, the evening Hari Om session was conducted by Mananeeya Praveenji. It was an interactive session where we were asked to share our good and bad experiences in VKVs as teachers. Before we got independence, people had to sacrifice their lives for securing independence. Now we are independent and we need to live a meaningful life was the main take away of the session. Apart from the regular training sessions by Prof Jayaraman ji, the presence of Mananeeya Hanumanta Rao ji Treasurer Vivekananda Kendra and Vivekananda Rock Memorial was a remarkable experience. His speech on the topic SEVA was an emotionally loaded one with much intellectual depth. Still his words are echoing in our minds. On 21/08/2015, the training sessions went as usual and the Hari Om session conducted by Prof. Jayaraman ji was really soul searching experience. He recalled his experience as a teacher in Yemen by narrating many incidents. The country has almost been crushed and torn apart by the terror of the radicalized Muslims. 22nd August was the third day of the camp. Apart from the regular training activities, the Hari Om session was conducted by Sri.P.M. Unnikrishnan Education Officer, VKVAP Trust. It has again been a soul searching task for all of us as he emphasized on the aspect of how equipped are all of us as teachers. He asked us to empower ourselves with the latest technology available. He promised that even the institution is ready to conduct training programmes for the teachers to keep a pace the race of technology. His words were highly motivating and the main take away from the session was a big question which demanded our introspection the how effective are we as teachers. He also asked us to write down our strengths and lacunae while working as teachers and the areas that we need to mend. The fourth day of the camp was blessed by Su.Radha Devi Joint Secretary VKVAP Trust. A School Level Debate Competition was organized by the Social Science Department of VKV Kuporijo on 27th August 2015, in the prayer hall of the same. The topic of the Debate was “Industrial development Vs Environment Protection”, wherein 20 number of students selected through the Class Level Debate from Cl-VIII to X participated having representation of 4 from each classes/sections. The programme started with the lightning of lamp by Sri. Krishna Tamang Sir along with the Shanti Path and was all over coordinated and anchored by Sri. Chat Bahadur Chetry Sir. Sri. Bhishwanath Mahanta Sir and Sri. Krinshna Tamang were the judges and Sri. Karan Lal Thatal Sir and Sri. Tako Siga Sir were the moderators for the various rounds of the same debate. Km. Lukyir Taji (Cl-IX/A) was adjudged as 1st Winner; Kr. Mato Kyamdo (Cl-VIII/A), 2nd and Kr. Tapung Rai (Cl-IX/A), secured 3rd position. The Prizes were given away by Sri. Kalyanam Bharadwaj. Total number of 300 students of Cl- VI to X witnessed the programme with full attention as it was a package of knowledge for them. And the programme ended with the Shanti Mantra. Teacher Sri. Kalyanam Bharadwaj, Sri. Krishna Tamang, Sri. Dilip Dutta, Sri. Chat Bahadur Chetry, Sri. Karma Lal Thatal, Sri. Bhishwanth Mahato, Sri. Tako Siga, Sri. M. SarojKumar Singh, Smt. Shefali Bharadwaj and Smt. Sanchita Dey Sarkar were present in the programme. 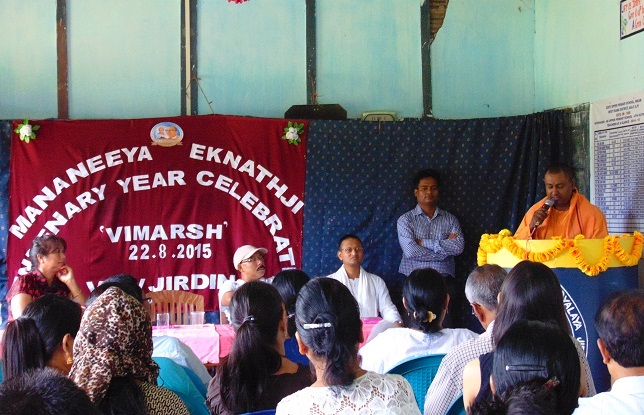 VKV Jirdin has conducted 'Vimarsh' program on 22nd aug. 2015 at Pakkam village govt.middle school, where 38 members were participated. Sri. 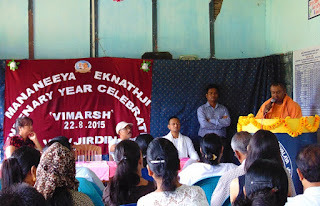 Kasturi Maharajji, Banu Maharajji, ZPM of Jini village, Principal of govt.school were the speakers in the program. The discussion was on the topic 'selfless service, dharma and women empowerment '. Most of the speakers stressed on 'doing good for others, expect in turn nothing and strengthening them to stand their own legs is real service'. Women asked for women education, freedom of speech and expression in their society. Regarding Dharma, there was unanimous belief that it is the righteous way of living. The program started at 9.30 am and ended at 12.30 pm. A Medical Checkup Camp, especially for eye-checkup, was organized on 18th of August 2015. A team of five members comprising with eye specialists as well as other medical members conducted the same examining thoroughly the eye vision of the students. Altogether 313 students (Classes I to X) were benefitted and provided spectacles and medicines to the needy children free of cost. Doctors advised the children to take proper care of their eyes and to undergo consultation of eye specialists if necessary in future. Sargam camps were conducted in three venues from 25 July to 9 August 2015 to teach patriotic songs, bhajans and Srimad Bhagawad Gita chanting to selected students of Vidyalayas run by Vivekananda Kendra. The first one in VKV Balijan had 37 participants from VKVs Seijosa, Nivedita Vihar, Banderdewa, Nirjuli and Balijan. 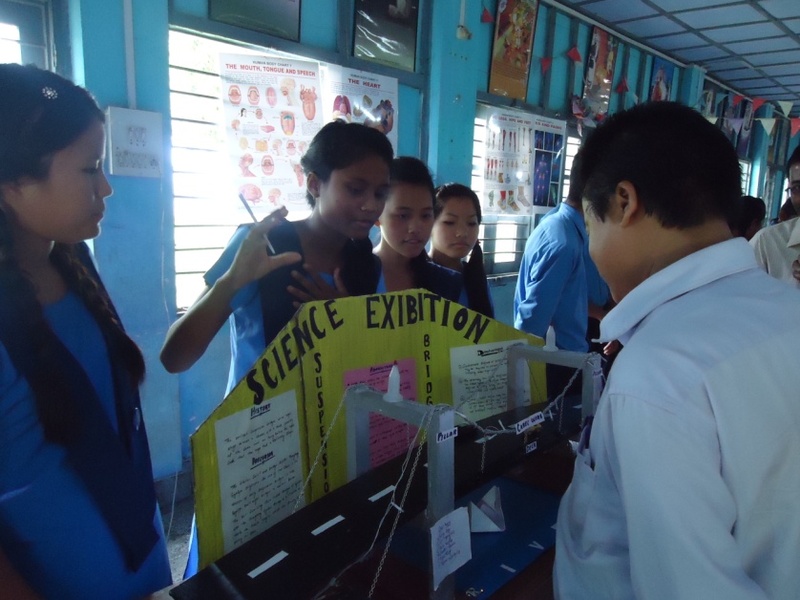 The second camp conducted in VKV Vivek Vihar had 30 students from VKVs Vivek Vihar, Itanagar and Sher. The third camp organized at EMRS Bana had 35 participants from VKVs Wessang, Shergaon, Kitpi Tawang, EMRS Bana and KGBV Wessang. Shri R Krishna Kumar from VKVAPT and Smt. Anjali Das from VKV, Balijan were the resource persons for all the camps. SPEECH : Advised the students to be happy at every moment of life. Formula for overcoming the three barriers of study. Speech: Advised the students to follow the paths of Guru. Failure is the first step for success. Sri.P.K.Pandey the cluster incharge of Lohit and Tirap was present and guided the team throughout the period. Sri.Bharat Linggi , Sri.Santosh Giri and Su.Aarti Giri were the referee for the event.